Is a Superintendent Like a CEO? As government agencies, the salaries paid by school districts are a matter of public record. A citizen tax watchdog group, Family Taxpayers Network, makes information on these salaries available at its website, "Champion News." Of particular concern are the wildly escalating salaries paid to some district superintendents in Illinois. Point of interest: the average salary -- that's the average salary -- of a school superintendent in the state of Illinois is higher than that of the governor! Overall, there are more than 100 school district officials in Illinois who make more than the governor. Big Pay, Little District by Jake Griffin, Daily Herald, May 21, 2014. "But at the very top of that list is Loren May, the superintendent of a five-school elementary district in Glendale Heights. The retirement system reports May's 'current creditable earnings' at $357,117, almost $23,000 more than any other educator in the system and one of 10 receiving more than $300,000 in the state. May's total compensation is 160 percent more than in 2002 when he started with the district. ... When he retires, his pension will start at more than $264,000 a year, according to the retirement system's records." Click here for FTN's list of the highest-paid administrators in Illinois. But wait, there's more! The outflow of cash for district bureaucrats doesn't stop with mere salary. Continue to the next section, How Schools Pad Pensions, to see how the pot is sweetened. if his salary depends on him not understanding." Click here for FTN's list of the highest-paid teachers in Illinois. Salaries for teachers vary widely. According to one newspaper report in 2003, Leepertown School District in Bureau County has the lowest pay in the state, with an average teacher's salary of $24,616, while District 211, a high school district in Palatine, Schaumburg and Hoffman Estates, is at the top of the list with an average teacher salary of $87,407, most for nine or ten months of work. Illinois Teacher Salary Study, 2004-2005 (PDF), Illinois State Board of Education, Data Analysis and Progress Reporting Division. This 129-page document is a trove of detailed information about Illinois teacher salaries and benefits, union representation, and teacher seniority. It includes aggregate summaries, as well as details for individual districts. 10-Point Analysis Helps Decipher Salary Schedule by Joseph Matula, Illinois School Board Journal, May/June 2007. "One of the most significant issues facing school board members during the bargaining process with teachers is the ever-present and often confusing salary schedule. ... After surveying 204 school districts and special education cooperatives in Illinois, I came up with a 10-point explanation of terms and comparisons to help board members when considering their teacher salary schedules. ..."
Cost-of-living isn't the whole story: John Biver of the Family Taxpayers Network wrote to remind us that cost-of-living increases in contractual salary levels are not the only way that teachers receive salary hikes. He says, "The truth is that teachers receive pay hikes in many ways. Some are automatic; others the teachers can give themselves. Teachers are eligible not only for cost of living increases, but for years of service, for extra duties like coaching, and for taking graduate level courses which bump up their 'credentials.'" Newspaper stories often miss these elements. Bringing Teacher Compensation into the 21st Century by Brooke Dollens Terry and K. Emma Pickering, Texas Public Policy Foundation, March 2008. "In 1921, Denver and Des Moines introduced the single salary schedule. Many other school districts proceeded in the same manner, and usage of this standardized pay structure swiftly gained in popularity. The salary schedule based teacher's salaries on years of expe- rience teaching and education level. ... 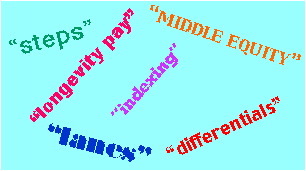 This is the salary schedule that is most widely used today." Eliminate the statewide minimum salary schedule that rewards seniority rather than effectiveness of instruction. Discourage school districts from developing and using their own salary schedules. Encourage school districts to pay teachers based on local campus needs and demand for subject matter expertise. Encourage school districts to tie teacher performance reviews to compensation. Stop giving all teachers an across-the-board pay raise since it does not increase overall teacher quality. Instead, it rewards effective and ineffective teachers equally. encourage and reward teachers for teaching in low	performing schools." Three Good Reasons to Become a Teacher: June, July & August by Nancy Salvato, Education News, July 16, 2007. "While a teacher, I worked hard and put in many extra hours on professional development, writing lesson plans, and grading papers. Now, employed in private industry, I find myself working even harder and putting in longer hours ... this in addition to the 58 days more I'm expected on the job than my former colleagues." Pension Gap Divides Public and Private Workers by Dennis Cauchon, USA Today, February 21, 2007. "Retired government workers are twice as likely to get a pension as their counterparts in the private sector, and the typical benefit is far more generous. The nation's 6 million retired civil servants ... received a median benefit of $17,640 in 2005, according to the Congressional Research Service. Eleven million private-sector retirees covered by traditional pensions got $7,692." Teacher Pensions Put Strain On State: End-of-career salary spikes inflate costs for Illinois retirement fund by Diane Rado and Darnell Little, Chicago Tribune, Sunday, June 29, 2003, page 1. "More than 70 percent of full-time teachers and school staff who retired in the suburbs and Downstate Illinois in the last decade pocketed double-digit pay increases and other perks shortly before leaving--costing state taxpayers millions in higher pension payments, a Tribune investigation has found. Using such salary spikes to boost pensions is legal in Illinois but highly unusual and sometimes outlawed elsewhere ... The perks have been doled out even as the economy soured, local districts battled deficits, and the Teachers' Retirement System ... struggled with shortfalls. "But though local districts pay for the perks initially, the cost of the inflated pensions that result is spread to taxpayers statewide, who largely fund the TRS system. "'This is insanity,' said William Huley, president of Arlington Heights-based Northwest Tax Watch. 'It's all about padding [pensions] at taxpayer expense. The salary and benefits are out of control.'" Henry Bangser, New Trier High School's superintendent, is looking forward to retirement in 2006. And why wouldn't he? A flurry of 20 percent pay raises will hike his annual pension as high as $232,500. That's more than governors get. And even if you don't live in Bangser's rich North Shore district, you'll pay for it. The superintendent of New Trier will retire in 2006 on a pension of $232,500 per year: "Forget the gold watch. Henry Bangser already got his retirement gift--a series of 20 percent raises that will nearly double his salary during his last five years as superintendent at New Trier High School. And those hefty pay raises will keep on giving after Bangser retires, at 57, from the affluent North Shore district on June 30, 2006. They'll boost his pension to as much as $232,500 a year. That's more than he ever made in a year at New Trier until this past school year. It will be one of the richest pensions of any Illinois public servant." JoAnn Desmond retired in 2002 as superintendent of a district that includes schools in Highland Park and Highwood. In "retirement" in 2003, she started work part-time (she says "eight or nine days a month") as superintendent of the tiny Bannockburn district. Her combined annual take is $217,000 -- $70,000 from her part-time job plus a $147,285 pension from her old job. The lowest-paid superintendent in Cook County oversees a single school in Thornton, and he gets a total compensation near $100,000. He muddles through somehow with his paltry six-figure salary: "If I was doing this strictly for money, I would probably be in another profession." Apparently, a common ploy used to fund these massive giveaways to fat cats is for a district to grant astonishing pay raises in the last few years before retirement. This pegs the salary at a very high level, in order to trigger commensurate pensions at a very high level. Why would a district do this? Easy: the district pays the salary for a few years, but it's the state that is stuck with paying the pension! Officials Try To Reform Complicated State-Funded Pension System by Jim Muir and Caleb Hale, Southern Illinoisan, August 21, 2005. "There are numerous loopholes state employees can and do use to pad retirement benefits. Jon Bauman, executive director of the State Teacher's Retirement System, recently discussed a retirement package that will pay James Hintz, a financial officer at Adlai Stevenson High School, more than $200,000 annually as long as he lives. Hintz received end-of-career stipends and pay raises of more than $100,000, which ballooned his final year salary that is used to determine his pension benefits. Bauman called the retirement package 'legal, but devious.' In Mr. Hintz's case, the district has taken a small opening and driven a truck right through it,' Bauman said. ... Arlington Heights Superintendent Robert Howard received pay raises of $78,370 over the last two years prior to retirement, plus $45,500 for 91 sick days. In the Palatine Township Elementary District Superintendent John G. Conyers received a 60 percent salary increase over his last four years prior to retirement. This boosted his final pay to $350,000. And in the New Trier Township High School District, Superintendent Henry Bangser received a series of 20 percent pay increases over his last five years before retirement, nearly doubling his salary to an estimated $346,000, not including other bonuses he was set to receive. 'Taxpayers are already paying incredibly high real estate taxes to cover school funding but some of these folks act like there is this hidden pot of money in Springfield ... And as long as the local school district isn't paying for it, then its okay.'" U-46 Super's Pay Far Outpaces Peers Across The Nation by Emily Krone, Daily Herald, February 18, 2007 "Elgin Area School District U-46 Superintendent Connie Neale this year will be paid at least $100,000 more than any superintendent in the country directing a district of similar size and wealth. ... Neale's current package weighs in at $329,667. A current proposal would inflate that package to $391,403 to lead Illinois' second largest school district. The disparity stunned some educators and legislators. 'This is about money and contracts and selfishness,' said state Sen. Chris Lauzen of Aurora. 'What this does to damage the reputation of public education is just disgraceful.'" "I've covered (and will cover again), the 'institutionalized greed' of the Government/Educational Complex. One of the most egregious practices, which if uncovered in a private corporation would be grounds for legal action, is the Teacher's Retirement System. In River Forest, the former Superintendent (a Ms. Tyra Manning) went from $184K in 2002, to $193K in 2003 to an obscene $226K in 2004, where upon she retired, soaking up a pension inflated by these gross increases. Ms. Manning is bankrupting the pension system and cheating younger teachers." This article goes on to document how many districts contractually build-in this massive taxpayer-funded giveaway, citing language from the Cary school district union contract as an example. "When you read about James Hintz's salary and pension benefits you can only feel one way: mind-blowing outrage. Hintz, in charge of finance for Adlai Stevenson Township High School District 125, has had his salary sweetened by so much over the last four years that he is going to leave his job next month with an enviable $200,000 yearly pension. "Schools need to start acting like businesses because their stockholders -- the taxpayers -- are wondering how their money is being spent. It should go into the needy classroom, not into rich end-of-career salary hikes and 35 years worth of sick days." Are district bosses worth that much? Isn't a superintendent kind of like a corporate CEO, and so should be paid highly? "Superintendents do not do anything even remotely akin to the primary function of a CEO. Superintendents do not operate in a competitive environment. They do not establish new markets for anything. They have no competition and so do not have to steal others' market share. They do not have to employ military strategy, or in fact any strategy at all, to win or hold market share. Actually, superintendents' 'markets' are pretty much handed to them on a platter by the state..."
Click to go to our page on superintendents and administrators.